Anita Raicame from a Nepali-speaking family and was born in Bhutan in 1989, during a time of violent ethnic and political conflict. Along with 100,000 other ethnic Nepalis, her family was forced by the Bhutanese military to flee in 1992 and they ended up in UN-supported refugee camps in the eastern Nepali province of Jhapa. She has been dancing as long as she can remember, and began dancing in school programs at the age of six. Both in Bhutan and back in Nepal, it was very important to her family that she carry on the traditional dance of her people. At first she was primarily self-taught, copying her older sisters in the refugee camp. Anita was invited to take dance lessons throughout middle and high school and then started teaching from the age of 18. She gave performances and dance demonstrations at all of the schools in the region. She estimates that she spent about thirty hours a week either dancing or teaching dance. She is well known throughout the refugee camps in Jhapa for her skills in traditional Nepali and Bhutanese dance. 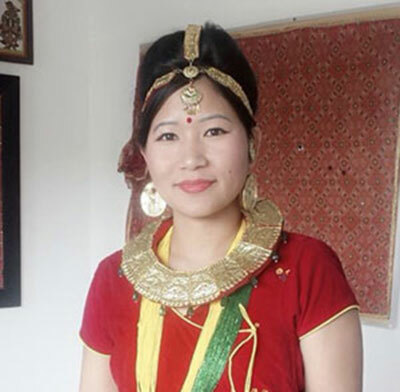 Unusual for a refugee, she was invited to perform Nepali dance in Bhutan on one occasion as well. She moved to the United States in 2014 and since then she has performed at cultural and dance festivals such as the CultureFest (April 2014), the Utica Music and Arts Festival (Sept. 2014), the Munson Williams Proctor Sidewalk Arts Show (July 2014), the MLK International Night (March 2015), and the International Festival at MVCC (March 2015), as well as other events in the region.